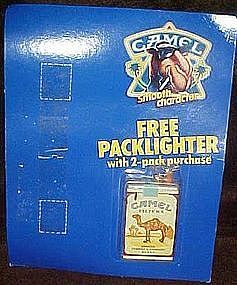 This little camel lighter was one of the popular premiums of the great Joe Camel advertising of the 90's. This was given to the consumer when they bought 2 packs of Camel cigarettes. This is still on the original card and sealed in plastic. The lighter looks just like a little pack of camel cigarettes and measures 2 1/4" x 1 1/2"